Here is a quick and easy way to block internet ads in your home. This also blocks various tracking services that collect information about your browsing (claiming to be to fine-tune ads for you) and makes internet browsing cleaner and faster. Everything I talk about in this post can be downloaded from a link at the bottom. I use a ClearOS Community Edition server as the innermost of my three-layer onion internet security gateway (as in layers of an onion, nothing to do with the TOR project in this post, although I will describe my TOR gateway in another post later). Among the many excellent features of ClearOS, the fact that it is built on CentOS makes it instantly familiar to those of us at ease with CentOS who want to customize everything. ClearOS comes with dnsmasq to serve DHCP and DNS requests. It provides IP addresses to DHCP hosts and forwards DNS requests to a higher-level peer DNS server. In my setup, I have three local area networks served by ClearOS: a dedicated 10.100.0.0 LAN for my hobby projects in the basement, a 10.200.0.0 "rest of the house" LAN and a host-only 10.42.0.0 LAN to provide internet to the DELL PowerEdge blade server itself that hosts all the virtual machines that make up the internet security onion gateway, and other VMs running on it. As a side note, I named my internet safety gateway system "DORMARTH" after the great hound (also called "Dormarch") from Welsh mythology whose assistance to warriors chasing down the enemy and facilitating the passage of the dead to the other side is legendary. Most of my server hostnames have "dormarth" somewhere as a result. Coming back to dnsmasq, before adding the ad-blocking feature, I checked on what was installed with CentOS and found the following primary configuration file. The line "conf-dir=/etc/dnsmasq.d" was immediately interesting, telling me there is a whole directory that I can drop configuration files in for dnsmasq to pick up, without having to change anything in the main configuration file /etc/dnsmasq.conf at all. Looking at the contents of /etc/dnsmasq.d, I found a single file /etc/dnsmasq.d/dhcp.conf which tells dnsmasq what interface to serve DHCP requests on, what IP address ranges to use for DHCP clients, how long DHCP sessions are valid before requiring renewal, etc. Now, we have enough information to add ad blocking to the dnsmasq configuration so that it stops known advertising websites from delivering ads to its DHCP and static clients. I decided to use the great lists of advertising servers and URLs maintained by Yoyo Internet Services. The types of lists we can download from Yoyo can be chosen using selection drop-down lists and checkboxes at their "Ad blocking with ad server hostname and IP addresses" web page. Among the numerous types of ad server list file formats, the two that I am interested in are the lists designed for dnsmasq using "address=" lines, and dnsmasq using "server=" lines. Selecting the corresponding items from the drop-down lists, choosing "no links back to this page" and checking the "view list as plain text" gives us the following two lists that we can simply dump into directory /etc/dnsmasq.d via a cron job and restart dnsmasq. Ad Server Block List configuration file for dnsmasq using "address="
Ad Server Block List configuration file for dnsmasq using "server="
The original adserver list file adblocklist.conf downloaded by wget contains the IP address of 127.0.0.1 that all the domains and URLs resolve to. However, I run a little custom HTTP server that responds with a HTTP code of 410 (GONE) to all requests while logging the request. The purpose of this minimal server (I have described it in detail with the source code here) is to log all advertising server requests that dnsmasq blocks based on the block-list. To do that, the 127.0.0.1 addresses in the block-list need to be changed to the IP 10.42.2.1 of the server running the small HTTP 502 responder. This is accomplished by the line "sed -i 's/127.0.0.1/10.42.2.1/g' /etc/dnsmasq.d/adblocklist.conf" in the above script. I will write separately about the little server, but there is an example of what it produces later in this post. Another subtlety of the above script is that wget preserves the time of the original file it gets from the remote site. The folks at yoyo update the lists last on July 21, and today is July 25. When I ran the script today, both adblocklist.conf and adblockserverlist.conf were fetched successfully by wget with July 21 dates on the files, but the sed command ran on adblocklist.conf, thus changing the file time of adblocklist.conf to the current. 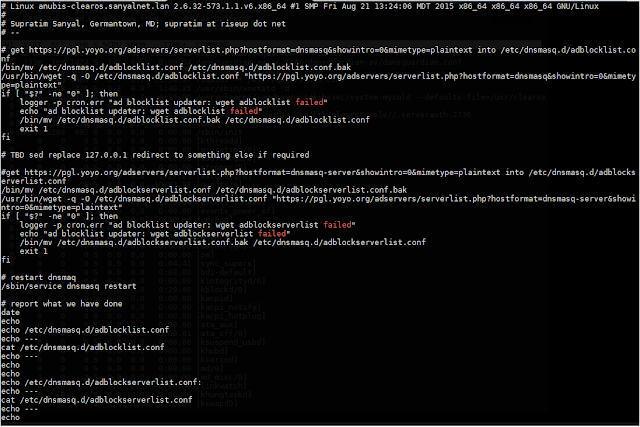 adblockserverlist.conf is not manipulated at all and the original file date is preserved.